GroupMap is an ultra-flexible mind mapping software that facilitates group collaboration and decision-making in real-time. With this software, you can design your processes online the way it is in your physical environment or modify it to make its connection with your existing workflow seamless. As GroupMap is intended for groups and organizations, one person is given the ability to build maps from scratch and to invite collaborators. Depending on the subscribed plan, you can invite ten to a thousand associates to work with you on plans and ideas. Moreover, GroupMap helps your team reach a consensus through different methods. The application gives you dot voting, rating, liking and disliking, and sorting tools for everyone involved to have a say in the final decision. GroupMap has a wide variety of templates you can use to jumpstart your mapping. But if you prefer to start from scratch, you can build custom mind maps, lists, and charts to suit the requirements of the project. You even have the option to add headings and instructions to help your colleagues focus their ideas. With GroupMap, you can rest assured that your organizational information is secure. The application lets you stringently protect your maps with passwords and every one of them has their own links. This way, individuals can only access the mind maps you invited them to edit. Every team has its own privacy and anonymity needs. To accommodate that, GroupMap gives you options to turn on full or partial anonymous participation for your audience. Or, if you prefer, turn off the option and show everybody who came up with ideas. 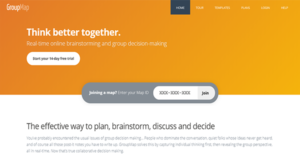 GroupMap affords you the ability to switch between three brainstorming styles: individual, idea suggestion by group members, or collaborative. This allows you, as the facilitator, to curate and manage individual ideas, show concepts to others to inspire them, and give everyone equal airtime. Each map you create can have its own set of brainstorming and decision-making tools. In particular, you can enable your collaborators to vote on their preferred ideas in different ways. GroupMap combines information in different maps to show you how the decision-making is progressing in real-time. This gives you a full overview of the goings-on in every workspace for you to stay on top of all issues. With GroupMap, you can say goodbye to manually reviewing data and creating comprehensive reports. The application automatically generates summaries of maps and turns them into web, PDF, or Excel reports. This way, you can review the collaboration of your team together with other stakeholders and executives. If you are interested in GroupMap it could also be a good idea to analyze other subcategories of Best Mind Mapping Software listed in our database of SaaS software reviews. There are well-liked and widely used systems in each software group. But are they automatically the best fit for your enterprise’s specific wants? A market-leading software solution may have thousands of subscribers, but does it present what you require? For this reason, do not blindly invest in popular systems. Read at least a few GroupMap reviews and consider the aspects that you desire in the software such as the cost, main functionality, available integrations etc. Then, select a few solutions that fit your wants. Try out the free trials of these platforms, read online opinions, get information from the seller, and do your investigation thoroughly. This profound homework is sure to assist you choose the most excellent software application for your organization’s specific wants. How Much Does GroupMap Cost? GroupMap has three options for enterprise pricing. They are tailored to suit the needs of organizations of different sizes. The packages are listed below with their prices and inclusions to help you decide which one is the best for your needs. We realize that when you make a decision to buy Mind Mapping Software it’s important not only to see how experts evaluate it in their reviews, but also to find out if the real people and companies that buy it are actually satisfied with the product. That’s why we’ve created our behavior-based Customer Satisfaction Algorithm™ that gathers customer reviews, comments and GroupMap reviews across a wide range of social media sites. The data is then presented in an easy to digest form showing how many people had positive and negative experience with GroupMap. With that information at hand you should be equipped to make an informed buying decision that you won’t regret. What are GroupMap pricing details? What integrations are available for GroupMap?